If 2014 was any indication, the Patriots defense will be tested immediately by one of the league's most potent offenses. Buoyed by career seasons from the All Pro trio of Ben Roethlesberger, Le'Veon Bell and Antonio Brown, the 2014 regular season saw the Steelers rank second in the league in both total yards (411.1) and passing yards per game (301.6). While they have enough pieces to still be dangerous, the group the Pats will face Thursday night has taken on several personnel losses already this preseason. Gone is center Maurice Pouncey, who was placed on the IR/return list after having surgery on his lower leg/fibula in August. Gone is big play threat Martavis Bryant, who scored 8 touchdowns in a supporting role as a rookie but now faces a four game ban for allegedly having general knowledge about possibly slightly deflated footballs multiple failed marijuana tests. However, the most important absence is clearly Bell, who is suspended due to a now infamous blunt cruise gone bad that also involved former teammate and current suspended Patriot LeGarrette Blount. There's no way to quantify the loss of a player like Bell, whose workload (373 total touches) was only topped by DeMarco Murray in 2014. Equally adept at grinding out tough yards between the tackles and working the poor mismatched linebackers who attempt to cover him, Bell was truly the engine driving the Steelers potent offense. This became clear during last year's divisional playoff game, which Bell missed with an injury, as the offense sputtered in Pittsburgh's loss to the hated Ravens. Below is some video evidence of the unique passing game mismatches Bell provides against linebackers. While he's no Bell, the Steelers did land a player with similar versatility in former Panthers star DeAngelo Williams to fill in during the first two weeks. Like Bell, Williams is a smooth athlete who can make plays both as a ball carrier and as an outlet out of the backfield. The days of him rushing for 1,500 yards are long gone (2008 was a long time ago), and it remains to be seen how much juice the 10 year veteran has left in his 32 year old legs. Last year's injury shortened season saw his numbers dip across the board, with his yards per carry (3.5) dipping below 4 for the first time in his career. The Steelers would love to get Williams going on the ground Thursday to prevent their offense from getting one-dimensional. If they can't, the Pats will be able to devote even more resources towards stopping Brown, who has emerged as arguably the league's best receiver. All he did last season was catch 129 balls for 1,698 yards and 13 touchdowns. Brown lacks the size of your typical #1 receiver, but more than makes up for that with an explosive combination of quickness, deep speed, precise route running and great hands. That skill set has helped him get constant separation during his NFL career, and he's a nightmare to tackle in open space after the catch. No matter which one of the corners winds up on Brown, it's hard to imagine the Patriots allowing them to go without safety help over the top. Brown is simply to dangerous to risk him getting behind the defense, and his importance to the passing game is only heightened without big play threat Bryant commanding some defensive attention of his own. 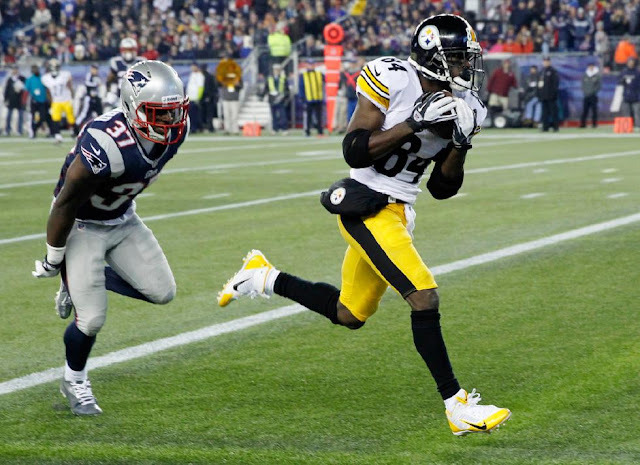 Given the massive drop off from Brown to the Steelers next available passing targets, I wouldn't be surprised to see the Pats devote their two best secondary members (Malcolm Butler, Devin McCourty) to Brown, making it as difficult as possible for Roethlesberger to feed his primary target and daring him to beat them with other weapons. With Bryant and Bell out, the second target in the passing game is likely to be the perennially hyped Markus Wheaton, who didn't have the breakout season many envisioned for him last year. He certainly has the talent (including a former track star's wheels) to produce more than the 53 catch, 644 yard, 2 touchdown line he posted last year, and will get his opportunities with Bell and Bryant out. The slightly built Wheaton has struggled to get off of press coverage at times, which could make him an ideal matchup for the physical Bradley Fletcher. The absence of those two really cuts into Pittsburgh's depth, which figures to be limited Thursday. 2015 draftee Sammie Coates has an intriguing size/speed combination, but the raw Auburn product is reportedly buried on the depth chart. That would leave third receiver duties to Darius Heyward-Bey, a former top 10 bust from the Raiders notorious for jaw-dropping timed speed and poor hands. Despite his disappointing career, Hayward-Bey's speed will still command some attention when he enters the game. With that much uncertainty behind Brown amongst his outside options, Roethlesberger could find himself turning to his tight ends more to move the chains. Neither Heath Miller nor Matt Spaeth will get confused for a dynamic passing game weapon, but both are solid all-around tight ends who bring steady hands and toughness over the middle. Miller in particular is a guy to look out for in critical situations, including the red zone, where he uses his size well to shield defenders from the ball. With so much attention likely focused on the Steelers ability to throw vertical routes, the Pats could find themselves vulnerable over the middle, where Miller has been productive for a long time in the NFL. The Patriots have struggled to cover tight ends at times over the past few years, and that's certainly an area to watch after Greg Olsen did some damage against the first string defense in the preseason. One other weapon to keep an eye out for is Dri Archer, who is one of the fastest players in the entire league. Archer's size prevents him from truly being a factor in the running back rotation, but his explosive speed and quickness makes him a nightmare to tackle in the open field. The Steelers will likely try to get the ball into the versatile Archer's hands in a number of ways (end-arounds, sweeps, screens), making him a guy the defense will certainly be aware of whenever he enters the game. Defending this Steelers offense is made more difficult by the unique challenges quarterback Ben Roethlesberger poses to a defense. He lacks the breakaway speed typically associated with mobile quarterbacks, but might be the league's best at scrambling and keeping a play alive, which is a terrifying place for a defense to be in thanks to the improvisational skills of Brown. Preventing those types of "breakdown" situations could be key for the Patriots defense, which will likely count on a disciplined, "controlled" approach to their edge rush. As they did last year against Aaron Rodgers, the defense's approach will be less concerned with rushing upfield and more focused on condensing the edges of the pocket on Roethlesberger, forcing him to step up by clogging up his escape routes. With the "control" rush approach potentially limiting their disruptive plays from the edge, the Pats will likely turn to their interior penetrators to collapse the pocket and prevent Roethlesberger from having all day to throw. That's where the absence of Pouncey could really hurt the Steelers, as journeyman Cody Wallace will likely get the start in his place. Wallace has held his own in the past filling in for Pouncey, but he's a far better run blocker than pass protector. I'd expect the Patriots to attack this weak-link in an otherwise solid Pittsburgh offensive line, with Dominique Easley in particular having the potential to wreak some havoc upfield. The need to generate pressure from the interior could also lead to more snaps inside for Chandler Jones, as the defense can afford to do so with two solid edge setters behind him in Rob Ninkovich and Jabaal Sheard. The bizarro Steelers face many more questions on the defensive side of the ball, where they're counting on a number of young players to breakout and become regular contributors. While there's certainly some talent in the front seven, the secondary appears to be a weak spot that will be attacked by a sure-to-be fired up Tom Brady. That secondary was nothing short of a sieve last year, prompting the team to spend a 2015 a second round pick on cornerback Senquez Golson. Unfortunately for them, Golson was lost for the year to a shoulder injury, prompting a trade for former Eagle Brandon Boykin. Despite his diminutive frame, Boykin was a competitive starting-caliber player for the Eagles, whose experience in the slot figured to strengthen the Steelers nickel defense. However, according to long-time Steelers beat reporter Ed Bouchette, Boykin has regressed enough in his short time in Pittsburgh to fall behind the underwhelming trio of William Gay, Antwon Blake and Cortez Allen. To put that into perspective, Allen was amongst the league's worst starting cornerbacks before getting benched and eventually suffering a season-ending thumb injury, Blake is a 5'9" undrafted special teams guy who got picked on when forced into action last year, and Gay had an underwhelming 2014 for a unit that got shredded weekly. The Patriots might not be at full strength without Brandon LaFell, but Brady should like the matchups he gets regardless. Julian Edelman and Danny Amendola should eat up any one of those corners in man coverage. Aaron Dobson could get a few chances to utilize his downfield skill set against those winnable matches as well, especially given the Steelers equally underwhelming duo of declining veteran Mike Mitchell and unproven youngster Shamarko Thomas at safety. Without LaFell, Brady could look to utilize his tight ends and running backs more in the passing game. That would set up some interesting strength-on-strength matchups, as the Steelers one clear defensive strength is the range of linebackers Ryan Shazier and Lawrence Timmons. The Patriots have always focused much of their offense on high-percentage, short passes, plays which typically try to put players in position to gain yards after the catch. Those yards could be harder to come by with Timmons and Shazier patrolling the middle of the field, although New England could utilize their tight end duo of Rob Gronkowski and Scott Chandler to occupy those two playmaking backers. Pittsburgh defenders have already gone public about their plans to jam Gronkowski every chance they get. That's probably the best strategy against his Gronkness, but there's only so much any strategy can do to limit a player of Gronk's caliber. No matter how or who they cover Gronk with, expect him to have constant safety help over the top. I wouldn't be surprised if the Pats move Gronk outside to the slot more as a counter, taking away Pittsburgh's ability to jam Gronk with their big, physical edge defenders and making it more difficult to help whichever unlucky defender gets matched up with him in coverage. Speaking of those edge defenders, the Steelers have invested a lot in them and will be hoping for better edge rushing than what they got last year. 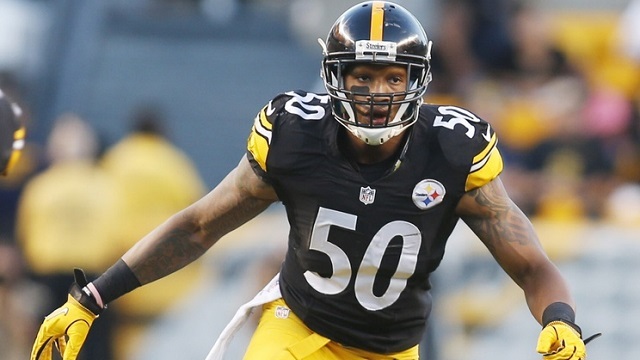 Another disappointing season from former first round pick Jarvis Jones prompted them to spend another first rounder on Bud Dupree, who possesses jaw dropping physical tools but comes into his rookie year very much a raw, unfinished product. Dupree might get some edge rushing chances this game, but expect him to be part of a rotation, with solid but unspectacular veteran Arthur Moats and the ageless James Harrison also in the mix. Harrison surprised everyone last year by coming out of retirement and instantly regaining his familiar role as Pittsburgh's best pass rusher. He still plays with the same physical edge that made him one of the game's most feared defenders in his prime, and stopping him will be key for the Patriots tackle duo of Nate Solder and Sebastian Vollmer. The Steelers pass rush will get a boost if second year man Stephon Tuitt's injured ankle heals enough for him to go. A 3-4 end with some surprising disruptive ability, Tuitt was a borderline first round talent who started slow but finished strong last year as a rookie. If healthy enough to play, his quickness could pose a challenge for a Patriots interior line that could wind up starting two rookies if Bryan Stork is unable to go. If Tuitt can't go, his spot will likely be occupied by veteran Cam Thomas, which is a drastic step down in terms of pass rushing ability. 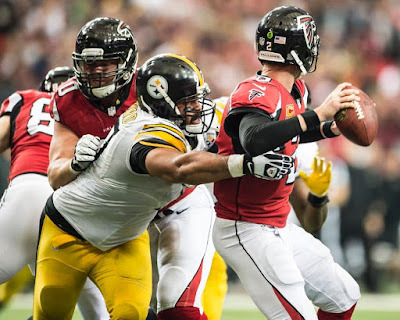 That interior offensive line will also face a steep test in Cameron Heyward, who has quietly emerged as one of the best 3-4 ends in the league. A stout 2-gapper in the running game, Heyward also brings underrated pass rush ability, as evidenced by his career high 7.5 sacks last year. With 11 passes defensed over the past two seasons, he also uses his length well to get into passing lanes and disrupt plays, something that surely has been noted by the Patriots in their preparation. Given their weaknesses in coverage, the Steelers best defensive hope lies in a disruptive performance from Heyward and Tuitt against whichever inexperienced combination the Pats roll out there on the offensive line interior (for my money, I'd go with Josh Kline at LG, Ryan Wendell at C and Tre Jackson at RG if Stork is unavailable). With LeGarrette Blount suspended and Jonas Gray a surprise cut, I suspect that the Patriots plan to attack Pittsburgh's defense primarily through the air. That would be a repeat of how offenses attacked Pittsburgh last year, when the Steeler's allowed the seventh highest opposing yards per carry (4.4) on the ground but gave up the sixth lowest rushing yards per game (100.3), thanks to facing the 30th most rushing attempts per game (23). In essence, the Steelers could be run on, but why pound the ball inside against a secondary that hemorrhages big plays? While many have speculated that Brandon Bolden will be the primary early down back, I wouldn't be surprised to see the Pats primarily attack out of passing formations, in turn drawing easier fronts to run against. In that scenario, I could see Dion Lewis leading the team in carries this week, as he'll certainly fit in those passing formations but possesses more toughness between the tackles than James White or Travaris Cadet. Lewis' explosiveness could make him dangerous if the Steelers are forced to defend him out the nickel all game. Cadet could be another weapon unleashed by a Patriots offense that will be looking to create coverage mismatches outside against a Steelers secondary lacking in depth. With no film from the preseason, the Steelers have no way of knowing how the Patriots will utilize Cadet, who was a dangerous receiving threat out of the backfield and in the slot with the Saints. Cadet's speed makes him a big play threat, and he has the hands to capitalize on the intermediate routes that Brady makes his money on. Finally, I'll be interested to see how Pittsburgh chooses to counter the Patriots super-sized combo of Gronk and Scott Chandler, particularly in the red zone. Both are extremely tough covers in that area because of the massive catch radius that comes with being 6'7". It's hard to figure out a way to effectively cover both with Pittsburgh's personnel; a dilemma that figures to be a weekly problem for whoever the Patriots face. It's an interesting group on special teams for Pittsburgh, especially given the possibility that the kicker position is cursed on this roster. After losing first Shaun Suisham and then Garrett Hartley to preseason injuries, the Steelers called up Jacksonville and gave up a sixth rounder for long-time Jaguars kicker Josh Scobee. Scobee has been a rock during his 11 season career and gives the Steelers a reliable-enough leg to take the drama out of what could have quickly become a problem spot on the roster. Scobee is solid, but the real threat from Pittsburgh's special teams comes from their dynamic return men. Both Antonio Brown (punts) and Dri Archer (kickoffs) have the open field elusiveness and wheels to turn any routine return into a game-breaking highlight. Archer can be neutralized on kickoffs at least by Stephen Gostkowski's powerful right leg, which figures to be easily booming touchback after touchback in the warm September conditions. The bigger threat is Brown, as it will take a good night of directional punting from Ryan Allen and strong lane discipline from the punt team to limit his chances to hurt them. The Steelers coverage teams were largely middle-of-the-pack last year, but that's something difficult to project given the year-to-year turnover that occurs on the bottom of NFL rosters each year. The bigger question will be who the Patriots line up on returns. Julian Edelman returns as one of the best punt returners (statistically) of all time. His importance to the offense can't be overstated, but it also hasn't prevented him from continuing to be a field position weapon during the two season's since his offensive breakthrough. Likewise, kick return duties could go to either Danny Amendola, who gave the team a real spark from that position last year, or explosive new addition Dion Lewis. Both players figure to be taking on sizable roles in the offense, and both come with prior history of being brittle. If the team opts to keep either from withstanding extra hits on special teams (again, I find this unlikely), they could go with either James White or Travaris Cadet, with the later proving to be a strong return man during his two years with New Orleans. Two well coached teams here, but the coaching edge goes to Belichick against any coach in this league until proven otherwise. Given the amount of time they've had to prepare for this opponent, you have to figure that Belichick, Patricia and McDaniels have something good cooked up for the game plan. Of course, the actual football on the field has been overshadowed all offseason by the face of the Patriots getting dragged through the mud by the corrupt, lying goons that make up the league office under Goodell. Brady might have been "freed" by Judge Berman, but the fact remains that he still had to undeservedly endure being the subject of a witch-hunt all offseason. Even before yesterday's latest attempt by league partner ESPN to redivert the "deflategate" narrative away from Goodell's egregious misbehavior in his handling of Brady's case, the Steelers figured to be heading into a buzzsaw: Gillette Stadium, whipped into a frenzy by the presentation of the latest banner delivered to their beloved team through the legendary heroics of their beloved #12. Think the environment the Bengals faced last year during the now infamous "on to Cincinnati", only on enough steroids to make the 2003 Panthers and 70s Steelers collectively blush. 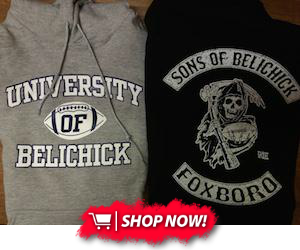 Now, the franchise finds it's well-earned accomplishments and, in-turn, the reputations of it's leaders Brady and Belichick once again called into question. No one does a better job of fostering a team-building "us against the world, eff everyone else" locker room mentality than Bill Belichick, and this time ESPN, Sports Illustrated and the league office have done all the leg-work for him. I don't care what the line is, and I don't care how much of a homer this prediction makes me: take the Patriots and take the over. I've been watching Brady and Belichick for far too long to expect anything less in this situation than a giant, on-the-field middle finger to the league and all the haters, most likely punctuated by Gronk flexing at the camera after yet another Gronk spike. Defend the wall, indeed.